In this post: Mini Angel Food Bundt Cakes that are a beautiful and fat-free dessert. This recipe is easy and fast. Cakes are baked in a Nordic Ware Heritage Bundtlette Cake Pan. I’m so glad you are here because what I’m sharing today is a rare occurrence! A healthy, fat-free dessert. Not only are these Mini Angel Food Bundt Cakes healthy, but they are very pretty as well. One more thing too…they are super easy. First things first though…let’s start with the baking pan. I got some cool new kitchen things for Christmas from my daughter. She gave me this Nordic Ware Heritage Bundlette Pan. (I’m assuming that a bundlette is a mini bundt cake!) Anyway, I couldn’t wait to use it and it turned out to be perfect for this recipe. I had never made an angel food cake from scratch before and honestly, I will never make the box version again. These mini angel food bundt cakes are fresh and have the perfect amount of sweetness. I really wondered how it could rise without any leavening, but it did. My version below is the combination of several different recipes I found online. Most of the recipes called for all-purpose flour but I opted for the cake flour, which is finer and makes a very tender cake. Every recipe I found said to fold in the dry ingredients with a spatula. I decided to try my paddle attachment on low, and it worked like a charm. Mini Angel Food Bundt Cakes. A beautiful and fat-free dessert. This recipe is easy and fast. Cakes are baked in a Nordic Ware Heritage Bundtlette Cake Pan. 1 1/2 cup egg whites at room temp. Separate 12 large eggs and place whites in the bowl of a standing mixer or large mixing bowl. Let stand at room temp. for 30 minutes. In a separate bowl, carefully whisk together cake flour and powdered sugar. Set aside. Add cream of tartar, salt and vanilla to egg whites. With a whisk attachment, beat egg white mixture on high for 4 minutes or until stiff peaks form. Gradually add granulated sugar and combine. Switch to paddle attachment with mixer on low (or use a spatula by hand) and add flour/powdered sugar mixture to egg white mixture 1/2 cup at a time. Fill mini bundt wells to the rim. Bake 15-20 minutes until light golden brown. Cool in pan for 10 minutes. Remove cakes and cool completely. Serve with Cool Whip or a dusting of powdered sugar. I used 10 extra large egg whites. I prepared my bundt pan with Baker's Joy. 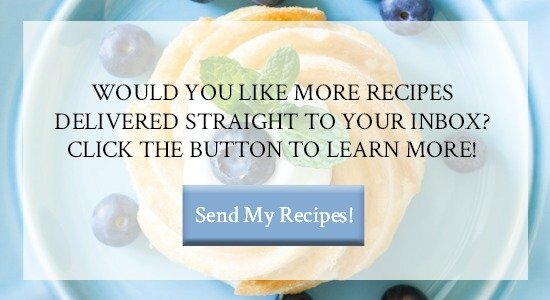 I got 10 mini bundt cakes from this recipe. If using a normal size bundt pan, bake 30 minutes or until golden brown and cake springs back when touched. When I took these out of the oven they were, of course, upside down in the pan. It wasn’t until I flipped the pan over that I saw how perfect they all were. Right then and there I fell in love with my bundtlette pan! 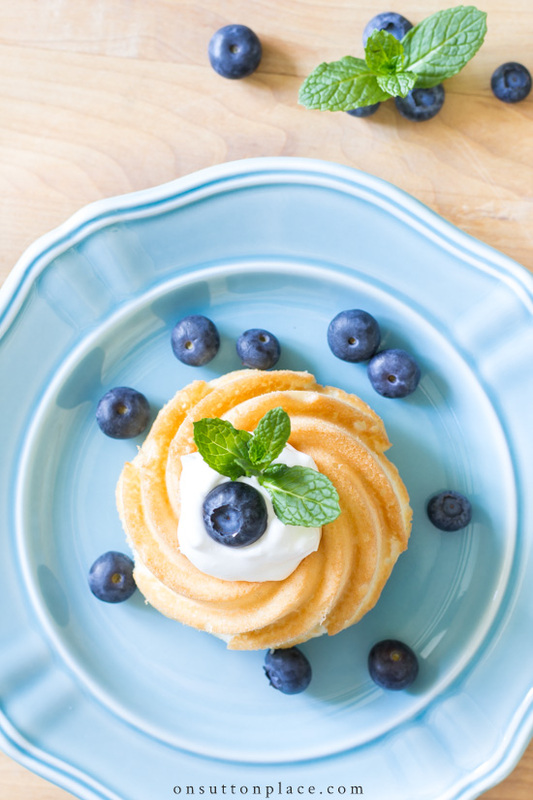 I garnished my mini angel food bundt cakes with Cool Whip Free, fresh blueberries and mint. 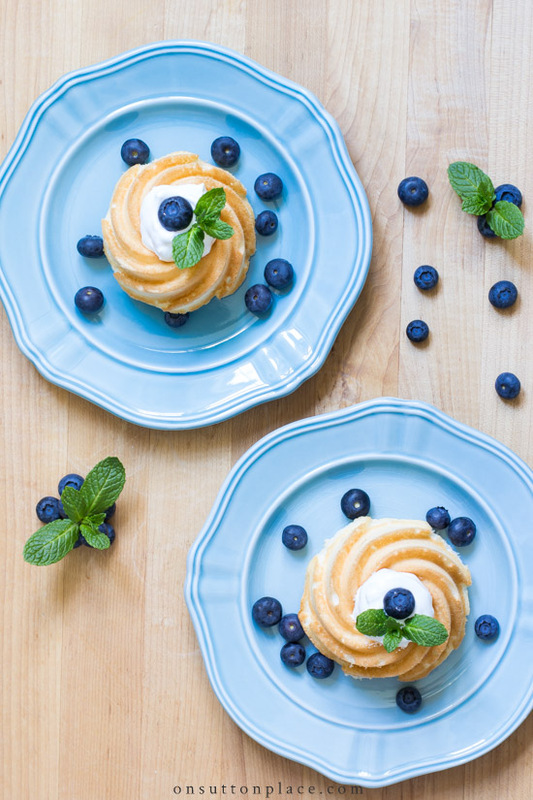 You can skip the blueberries and mint, but definitely serve the Cool Whip because it adds just the right taste. I’ll be back on Sunday with something…not exactly sure what though! I still have my JOY printables hanging in the entry so maybe I’ll make us some new artwork. All my Christmas stuff is put away except for those, so I need to do something about them soon. I sigh every time I come down the stairs. Ha! Thanx for what looks like a great recipe… and for realizing we’d want to know more about where you got that bundtlette cake pan! I’ve ordered it so it should arrive Friday, in plenty of time should I use it for Valentine’s Day goodness. I’ll have to search whether egg whites are available sold separately but am figuring if not that I should be able to use yolks in place for whole eggs in other recipes, right? I have only made one Angel food cake from scratch years ago and did not know what to do with all the egg yolks so never made another one. How did you use your yolks. Please, no judgement – have you ever tried used a box mix? In the interest of time, maybe for a wedding shower, wonder if it would work? I love the real thing also, but time constraints are an issue and I don’t think angel food can be frozen. Thanks! Totally use a box mix if time is an issue. I bet it’s just as good! How did you get them to come out so perfect? Mine didn’t want to budge. I used a smaller than the one you showed and I had to yank them out. When I used the one you have shown, I couldn’t get them out without destroying them. Heeeeellllllpppppp!! Hi Susie…I’m sorry you are having trouble. I use Baker’s Joy to prepare my baking pans. I generously cover the pan completely. How were you preparing your pan? die kleinen Kuchen sehen toll aus.Aber woher bekomme ich die Backform? Würde mich freuen eine Nachricht zu erhalten. 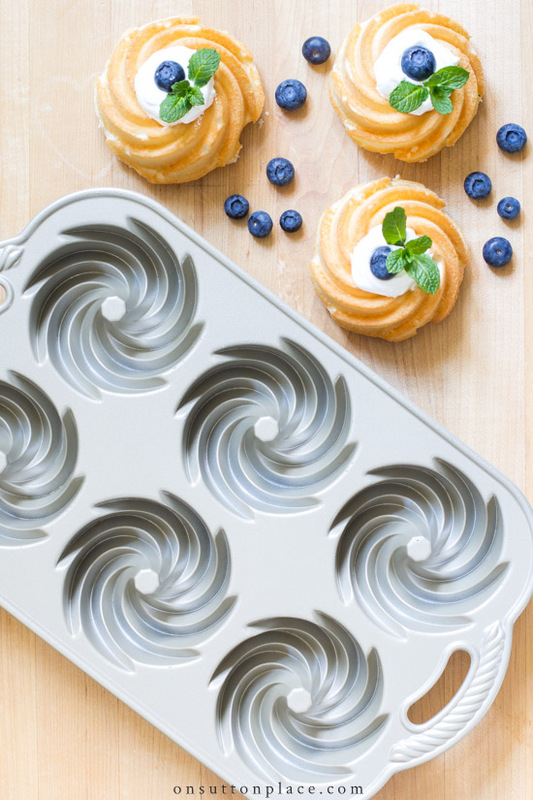 Here is the Amazon link to the mini bundt cake pan. I am so excited to try this recipe! I have some mini bundt cake pans (that I have yet to use) an this looks like a great recipe. Not just for the pans but also to avoid a boxed cake mix!! Your little bundt cakes are too cute. They look yummy.and your serving board it too cute.. Thank your fo the recipe. Thank you Ann for these lovely and low fat little cakes. I love Angel Food Cakes and will be trying this recipe soon. That little blue bird is just so precious. Well done! Looks scrumptious, and what a beautiful serving plate job! Recipe is printed and ready to go! Many thanks! I LOVE the positive energy in all of your posts. These little angel food cakes look perfectly delightful, and would be great to serve to my women’s group. Someone is always watching their weight, and one is diabetic. I so enjoyed everything you posted over the Christmas holidays! Thank you! I can’t wait to try this recipe. I ordered my mini bundt pan and as soon as it arrives I will start baking. Thank you again for sharing, your recipe’s are always so good. 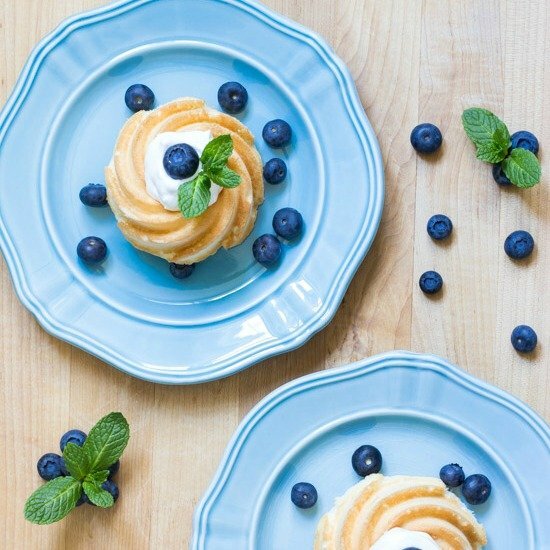 Love your pretty blue plates. Can you share where to get them? Hi Michelle! I love them too. I got them a few years ago at Target…not sure if they still carry them or not. I looked on the website but did not see them. Thanks for visiting! Hi Ann to your site…loving it. Wondered if you know of a sub for some of the sugar that would work well. Trying to cut down on sugar…..
Hi Sona! I’m not sure if you could substitute Stevia for the granulated sugar or not. You could try…I honestly wouldn’t substitute the powdered sugar. Your cake may fall flat. If you figure this out could you let me know? Thanks! These look so good and easy, too. I remember when we were young and our birthdays rolled around, when mom and grandma asked us what kind of cake we wanted, we always said angel food. I always enjoy your recipes (your eggnog bread was a big hit at Christmas) and can hardly wait to make these. First – off to buy those pans. Pinning this Ann! Love angel food cake and these little bundts are the perfect portion! Don’t you just love Nordic ware! This is a great use for all the egg whites I am generating, after trying the pickled egg yolk thing from the NY Times! Substitute lemon flavor to make a perfect pairing with blueberries. Hi Eddy! Yes lemon would be fabulous. Thanks! I want to make this with Bob’s Red Mill GF baking mix 1 to 1. I will lwt you know what happens. I love all of my Nordic Ware pans but I don’t have the bundtlette pan (yet). The mini angel food cakes look wonderful and I can’t wait to try your recipe. After seeing the adorable bread board your daughter gave you, I couldn’t help going over to browse around the Nora Fleming website and I think the interchangeable minis on serving pieces are a great idea. I know just the friend that I want to buy them for and wish her birthday wasn’t months away. Thanks so much for sharing and I am looking forward to your next printable! Ann your photography is the best in the blogosphere. I love the beautiful presentation of your mini bundt cakes on that adorable bread board! It looks like 12 regular size eggs or 10 large eggs were used. Sounds like a recipe I would like try. Thanks, Ann, for this recipe. I have never been a fan of box angel food cake mix. No…if you are using large eggs it will take approximately 12. I used extra large eggs and it took 10 egg whites to equal 1 1/2 cups. Sorry for the confusion!